Early this afternoon I had a last wander around Great Yarmouth's seafront area during 2017 to see what was about. 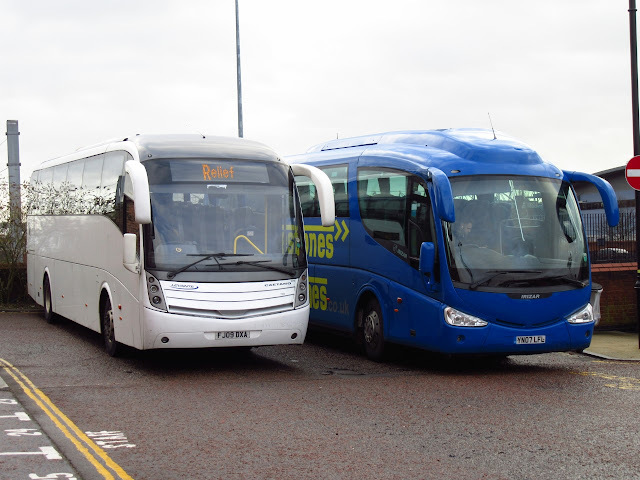 Six coaches were observed with half of them coming from the Chorley-based Alfa Travel fleet. Two were parked outside the New Beach Hotel on Marine Parade in the form of 77 (BU13ZTX) and 90 (BX15OED). The third, 68 (BN12CLY), was located next to the nearby Hollywood Cinema. All three Mercedes Benz Tourismos had previously escaped the attentions of my camera! Two coaches, chartered by David Urquhart Travel, were also in town; AVA Coach.Com's VDL PT64AVA was located opposite the SeaLife Centre close to the Hotel Victoria where its passengers were based. 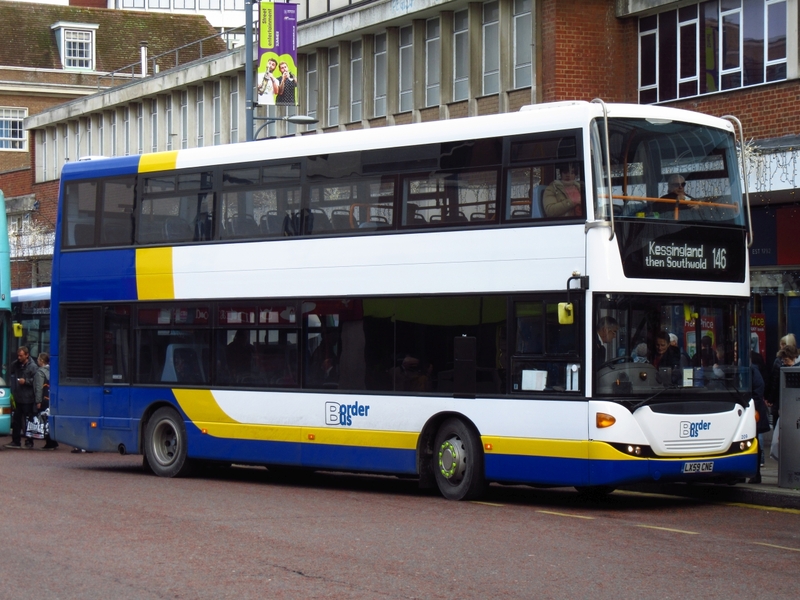 The second was AAA Coaches' VDL/ Futura HD JR67AAA, recently new to the Edinburgh operator as SF67OTC. It was seen eastbound on St Nicholas Road and unfortunately no photo as I was driving at the time! With the year nearing its end all that remains is to wish everyone all the very best for 2018. Well the end of 2017 is nigh and i had one last photo session in the city this morning to finish off what has been a relatively quiet year for me with the camera due to other commitments. I decided to venture to Norwich armed with said camera and christmas vouchers to see what was around on a dull & chilly Saturday. First up i was greeted by Borderbus ex London Scania BB06BUS (ex LX59CLV) pulling on to the stand in St Stephens to work the 146 to Southwold. Next up is Konectbus (ex Anglian) Scania AN61BUS now minus fleetnames but still wearing its branding for the now defunct 61 service, seen in St Stephens working the 5A to Eaton, the stand in front had a 5 series branded Enviro 400 working the 37A! 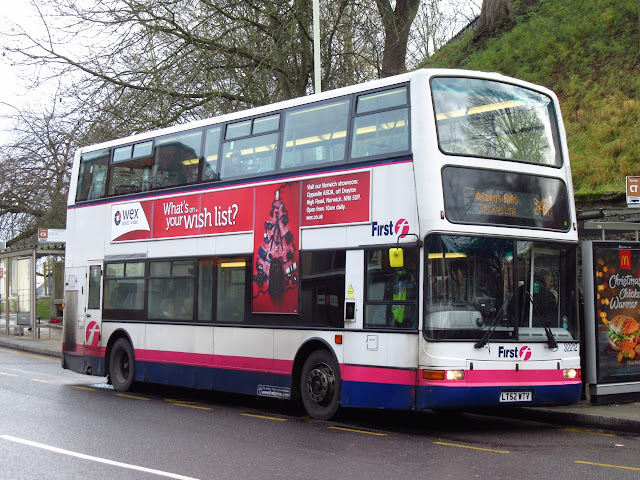 Former Turquiose line liveried First Trident 33167 LR02LYF has gained an allover advert for Asda and is now seen regularly working the 37/38 Purple Line services. I wandered down to Norwich Station to see what was around Bus and Train wise, two coaches were noted on replacement standby in the shape of Ambassador Travel's former National Express Levante FJ09DXA and Freestones Irizar YN07LFL. Finally after some shopping and coffee it was back to the Bus Station to hop on the X1 back to my car at Acle. Noted parked up was Enviro 200 MX13BAU which is operated by Simonds of Botesdale. I would like to wish all our readers and contributors a safe and happy 2018, here's to another bumper year ahead for the blog, finally many thanks and best wishes to Roy for continuing to have me on board! The last Eastern of England Transport Commissioner's Notices & Proceedings Report for 2017 contains one entry of 'local' interest. It relates to the surrender of an operating licence by Arthur Stanley Tolver (trading as A Tolver Taxis & Travel) of Danesbower Close, Blofield on 16th December 2017. With another year coming to an end, we usually look back on the highlights of the previous twelve months. Unfortunately this year, due to the usual pre-Christmas madness, time constraints and attending to a serious health issue with a close relative, the blog is unable to bring the usual customary detailed annual review. However, the main talking point of this year has been the slow painful demise of Beccles-based Anglianbus; which many thought might happen but hoping that it wouldn't! Following yesterday's final run of the 61 route, the Go Ahead group subsidiaries now no longer serve our two towns. Their withdrawal from the Norwich - Great Yarmouth corridor also means that First Eastern Counties is now the sole operator along the A47. 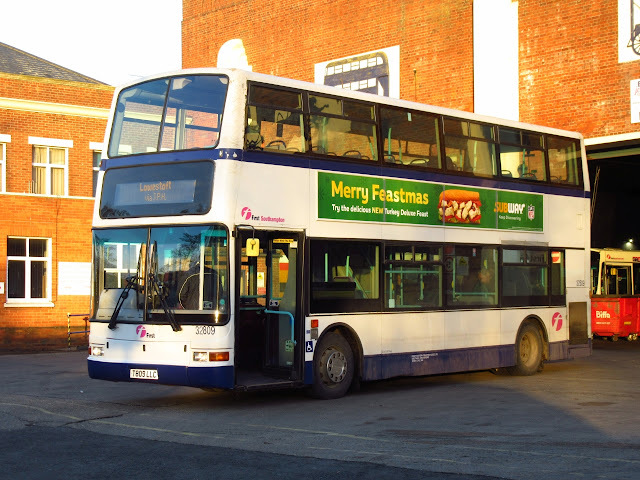 During the year, First Great Yarmouth lost and gained some vehicles but the highlight during the summer months was that many of First Norwich's multi coloured buses were being pressed into service whilst here for their MOT. BorderBuses continue to go from strength to strength with the recent arrival of four ex Stagecoach London Scania Omnicities. On the negative side Great Yarmouth's Swift Taxis finally handed in their operator's licence during February this year. With a number of buses rumoured to be arriving at First's Caister Road depot plus the impact of Norfolk County Council's proposals to cut bus subsidies from April 2018, next year could be another 'interesting' year. If you would like to support local bus services or provide a comment on the County Council's proposal you can do so via email at HaveYourSay@norfolk.gov.uk before the 2nd January 2018. 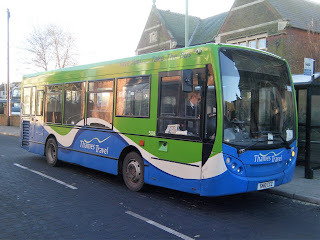 As East Norfolk Bus Blog nears its one and a half million page views (and achieves an all time monthly high of some 36,000 views in May) I would like to thank all of our readers for supporting the blog over the past seven years. My very special thanks goes to Grahame Bessey for his many tireless contributions and support - I don't know how he manages to spare the time with all his other commitments! My thanks are also due to Tim Miller, Kieran Smith, Kyle Hewett, Will Drake, Cameron Robinson, Roger Bellward, Colin Thorne, Colin White, Neil Chilvers (and Reg Vardy! ), Christian Newsome, Tim Major, Syd Eade, Joe Leathers Watson, Chris Speed, Sheldon Rees, Robert Collins, David Bell, SteveW, Kevan Portas, Robert Kelly, Tom Baker, David Warren, Sam Larke, Ross Newman, Ian Richardson, Graham Richardson, Glenda Brown, Simon Bartram, Cody Cooke, David Oakley, Dan Dearing, Graham Ashworth, Simon Taylor, Ryan Durrant, Nicky Pursey, Michael Sayer,Martyn Jarvis, Zak Nelson, Zeus Wearn, Marcin Zarkowski, EHBusman and Compass Bus for their support too. My apologies to many I may have left out, but their help is very much appreciated all the same! Last, but not least, ENBB would like to wish all readers, supporters and contributors a very merry Christmas and a happy, healthy and prosperous new year. Hopefully 2018 will be another busy year and, as always, we will endeavour to continue with our high standard of reporting into our eighth year! 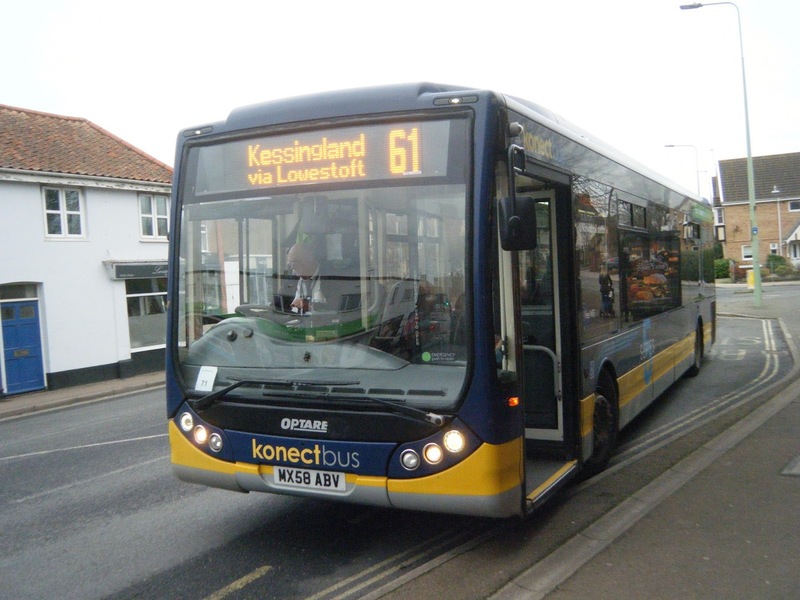 Today was the very last day of the Anglian/Konect bus 61 service which on Saturdays only operates between Kessingland High Street and Lowestoft Bus Station. See the timetable below. They did though with the appropriate 455 (AN61LAN) arriving at Lowestoft Bus Station one minute early on the 13:25 from Kessingland. The offside views show the amended branding of 455 following the shortening of the 61 route. After a quick turnaround AN61LAN departed for the very last time on the 61 back to Kessingland with a friendly wave from the driver. 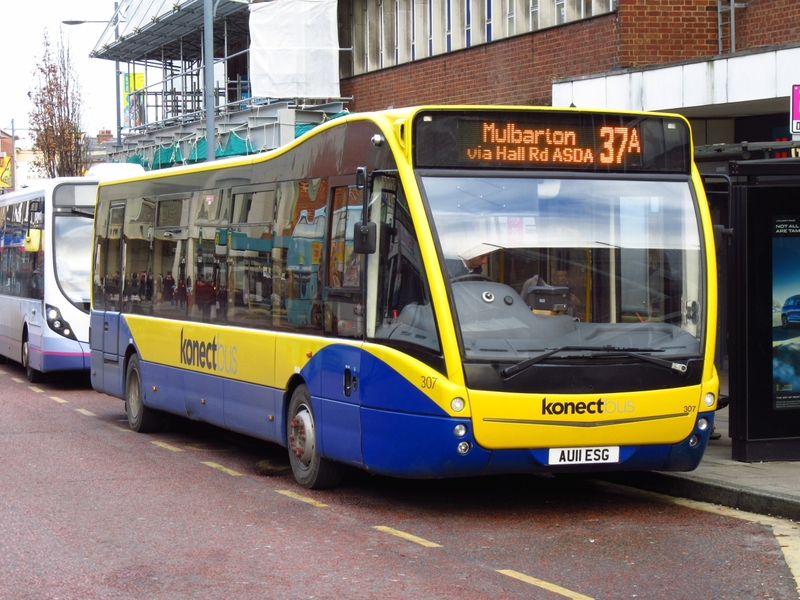 And that was it - the end of an era with regular Anglian/Konect bus services in Lowestoft and Great Yarmouth coming to an end. My thanks to Simon for his help and for his photos to support this post. 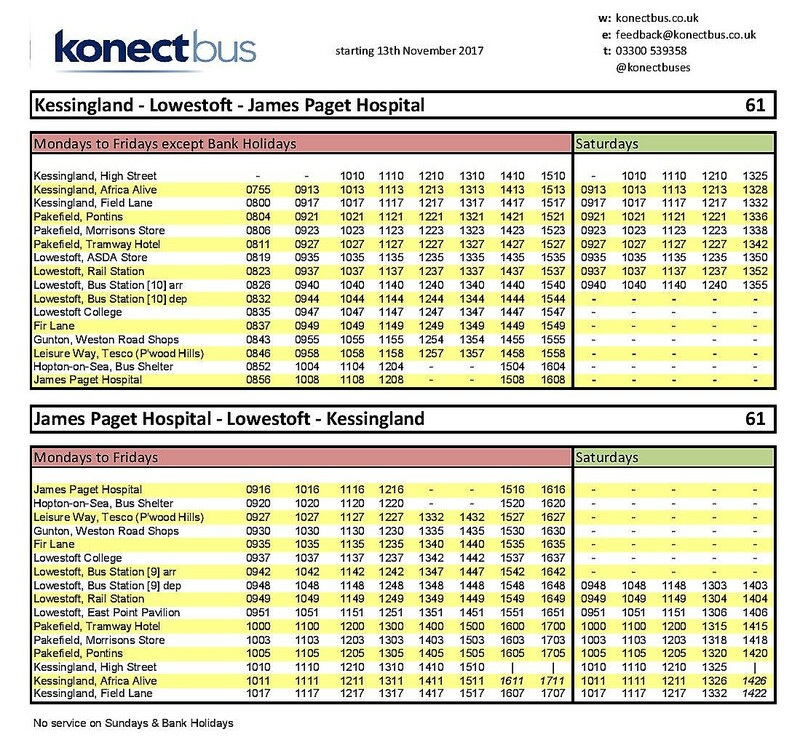 Today marks the last day of running the Anglianbus (operating as Konectbus) 61 from Kessingland to the James Paget Hospital in Gorleston,. The Saturday service runs between Kessingland and Leisure Way (Tesco) in north Lowestoft only. With two of the six return journeys to the Gorleston Hospital cancelled yesterday, I was hoping to get at least one photo of the last day's operation into the JPH. At 11 am I waited at the A12 roundabout in south Gorleston for a different photo location. The 10:10 from Kessingland was due to arrive at 11:08 - it didn't! There was nothing on social media to say that it wasn't running - a terrible way to treat passengers even though the service finally ceases tomorrow. The 12:08 arrival did appear (on time) with Scania OmniLink 451 (AU58AUV) in charge complete with its konectbus branding. I also captured the return southbound working on the A47 to Lowestoft. After today, Anglianbus/Konectbus vehicles will no longer be seen in regular service in the Great Yarmouth and Gorleston area. The Second ex London Scania to gain Borderbus livery is just about ready after work at Hants & Dorset Trim. It has been converted to single door and gained some new seating also. BB57BUS is fleet number 210. It was previously LX59CNJ. Many Thanks to Mike (EH Busman) for use of his photograph. 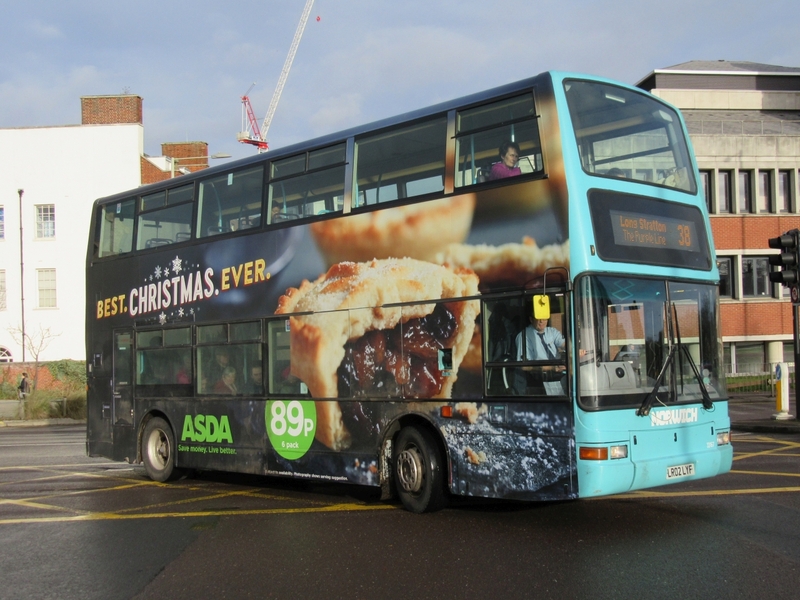 To help you plan your bus journeys over the Christmas and New Year period we have prepared the following information which has been obtained from the major bus operator's websites. No services will operate 25th, 26th December 2017 and 1st January 2018 - normal services will run on other days. 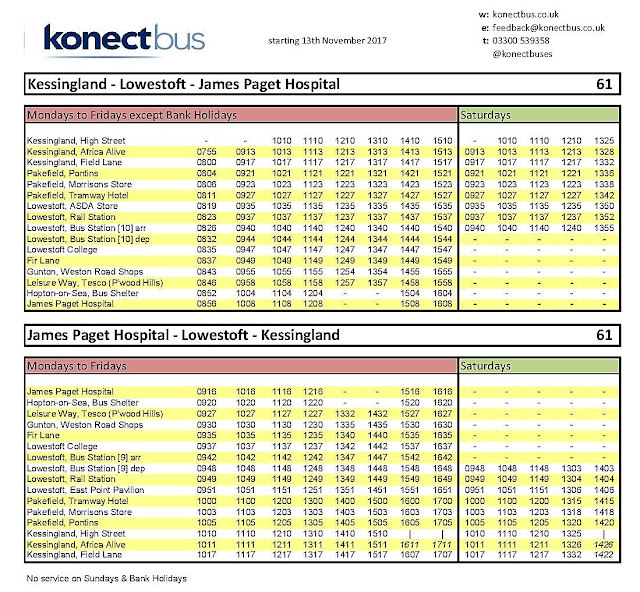 Note that the last day of operation of the 61 Kessingland - Lowestoft - James Paget Hospital service will be on Saturday 23rd December 2017. No services will operate 25th, 26th and 31st December 2017 plus 1st January 2018 - normal services will run on other days. 24th December 2017 Normal service with an early finish at 18:00. 25th/26th December 2017 No services. 27th to 29th December 2017 Saturday services will operate. 31st December 2017 Normal service with an early finish at 18:00. 1st January 2018 No services. No services will operate 25th, 26th December 2017 and 1st January 2018 (except for football related services on New Years Day) - normal services will run on other days. For further information contact the operators direct - click on Local Operators webpage above. One of the 17 plated National Holidays' Mercedes Benz Tourismos made an appearance at Great Yarmouth's Beach Coach Station this afternoon. NH17PFH is one this year's intake of fourteen examples of the 12 metre version purchased by the operator this year. Thursford again appeared to be the main destination for the visitor. There are currently four vehicles off the road awaiting attention at First Great Yarmouth's Caister Road depot. Two need a new engine, one requires a new gearbox and the other an MOT. In the first category is Excel liveried ADL Enviro400 33821 (YX63LKL) and Dennis Dart SLF 42920 (EU05AUM). Whilst the latter has only been out of action for a couple of days, it will be the first of the twosome to return to service with work expecting to commence early next week. 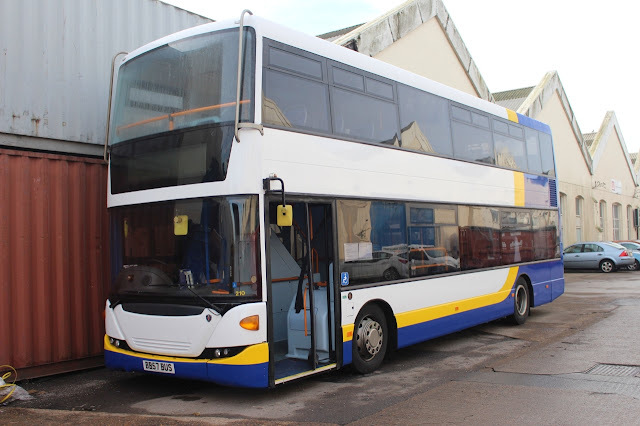 Plaxton President bodied Volvo B7TL 32205 (LT52WTL) is to benefit from the new gearbox whilst Volvo B12M/ Plaxton Paragon coach 20514 (WV02EUP) is the one awaiting an MOT. My thanks to First Great Yarmouth for the information. A couple of fleet changes to report this evening with the first being a First Eastern Counties loan. 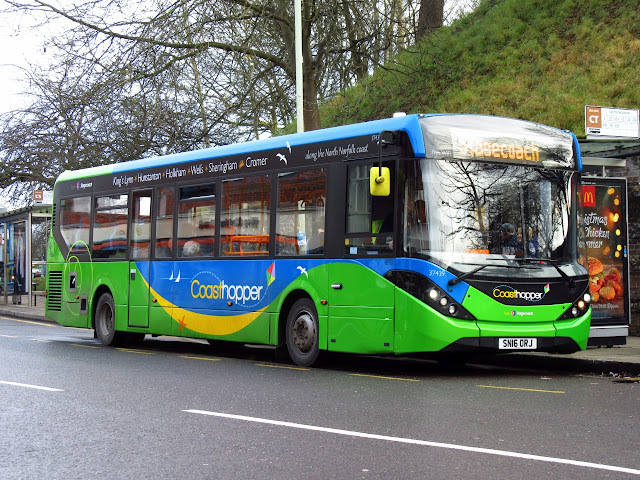 Great Yarmouth's Caister Road depot are using Lowestoft's ADL Enviro200 45118 (ST09JPT) for a temporary period of time. It was observed in Gorleston High Street this afternoon heading for the James Paget Hospital on service 9. 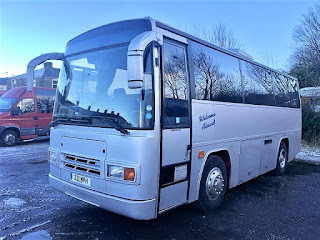 Meanwhile, most of you may have seen on Steves Bus & Train Page blog that BorderBus has acquired a fourth former Stagecoach London Scania OmniCity decker in the form of LX59CLV. Again it was noted in Gorleston, but on Church Lane this time, heading for Great Yarmouth on the Waveney Line 580 service from Bungay. As you can see from the photo, it is currently operating in 'London Red' livery and it is shortly to receive the registration BB06BUS and fleet number 211. For the third consecutive week there are no changes to local bus services to relate following the publication of today's Notices & Proceedings Report by Eastern of England Transport Commissioner. 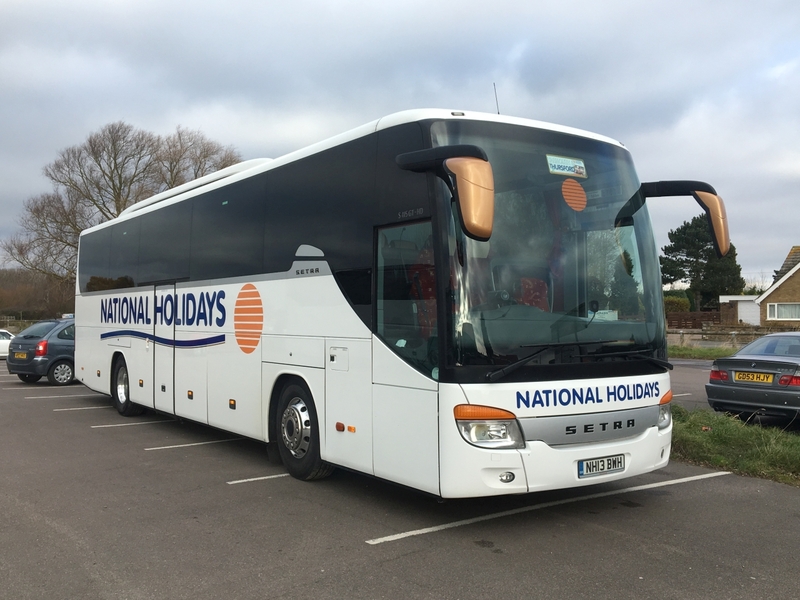 Whilst some of the country was treated to snow, we on the east coast were enjoying a wet and wintry day with, surprisingly, quite a few visiting coaches present along the seafront area. Further along, nearer the pier, was Simonds' Van Hool bodied Volvo B12B YVF158 with a friendly driver onboard. On the opposite side of the road, outside the New Beach Hotel, was a Van Hool T916 registered YJ09CUU and operated by Hertfordshire-based Mason Coaches. At the other end of Marine Parade, close to the SeaLife Centre, were two National Holdays' and a single Shearings Holidays' coach. All were Setras with the former represented by NH11MTH and NH13JWH and the latter's 220 (BF10VCN). 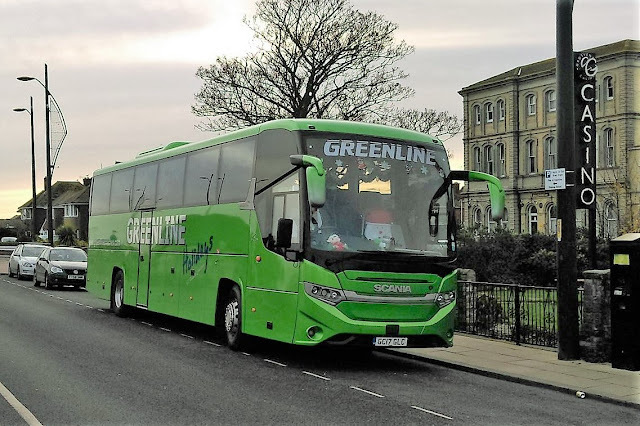 Earlier today the town received a visit from a Greenline Coaches Scania K420EB4/ Interlink Finesse HD coach. Based in Stourbridge, GC17GLC looked very smart in the company's green colours when sighted on Marine Parade. 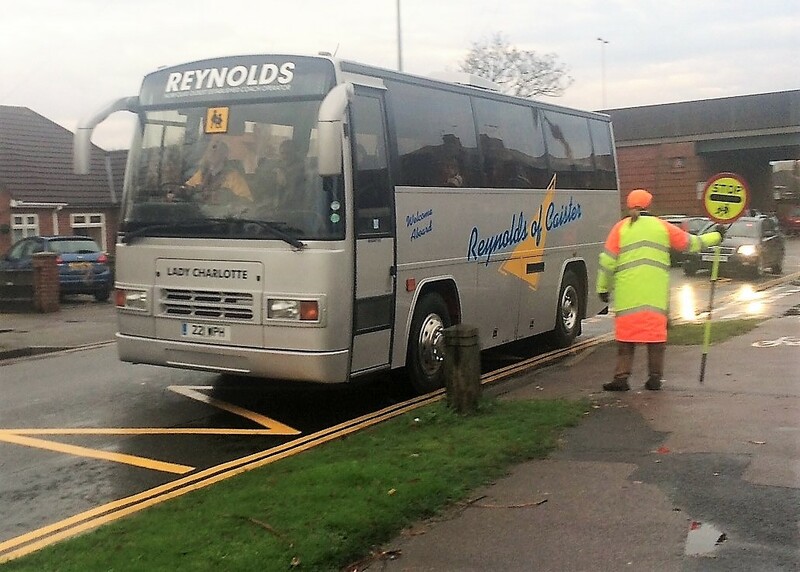 Two of the quartet of Caister-based Reynolds' Coaches made available for sale in August, have now found new owners. The oldest was Plaxton bodied Dennis Javelin 221WPH, which was originally thought to have been sold for preservation. 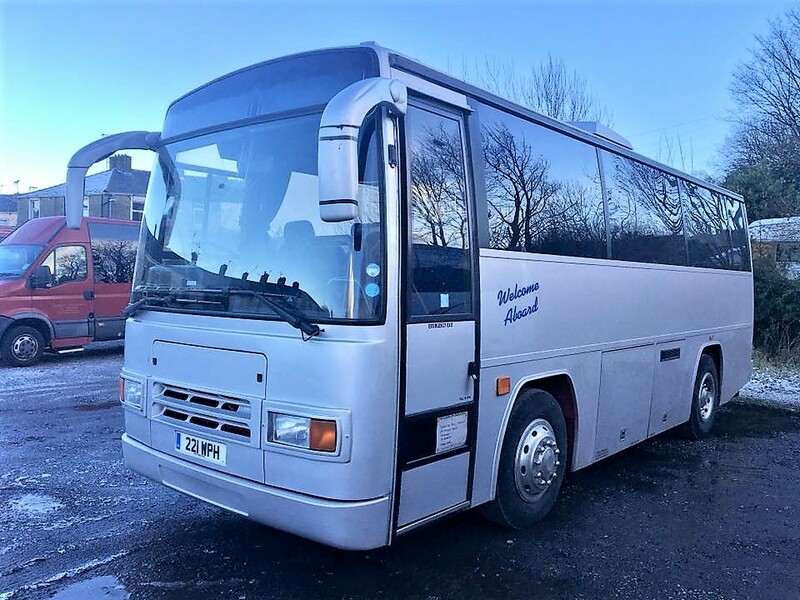 The coach, new to Woodward of Glossop in 1989 as F740MVR, is now with Derrick Ball Coaches of St Helens on Merseyside and still retains the Reynolds silver grey livery. My thanks to Darren for the use of his photo. 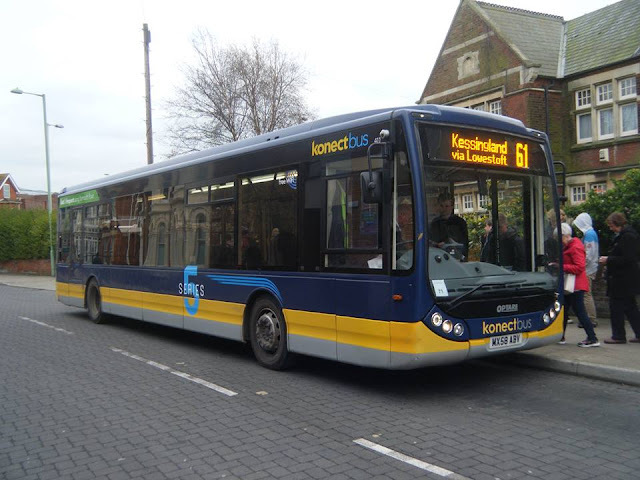 Our Lowestoft correspondent Simon Bartram reports that a Series 5 liveried Konectbus appeared on the 61 service during early yesterday afternoon. My thanks to Simon for the report and pictures. 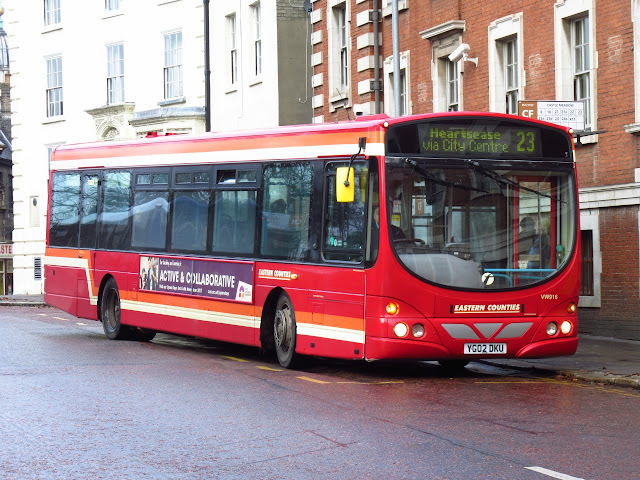 For the second consecutive week there are no changes to local bus services to advise following the publication of today's Notices & Proceedings Report by Eastern of England Transport Commissioner. Also in town and parked up on Marine Parade were two similar National Holidays' Setras NH14EBH/KBH; both based here whilst visiting the Thursford Spectacular. Nearby was a Grand UK Holiday's branded BU16UWY from the Olympia Travel fleet based in Wigan. The coach is a Jonckheere SHV bodied Volvo B11R. An unidentified Majestic Tours coach was also observed in the Burlington Palm Hotel car park off North Drive. My first trip up to Norwich for a while with the camera today, hoping to see the latest FEC heritage repaint in use but that never materialised, typical when you make a planned trip! I had a few to catch up on anyway so all was not lost. First up was the other heritage liveried Volvo B7L 60916 YG02DKU which was working the 23 service this morning, my first efforts of it in service. Next up is Yarmouth Volvo B7TL 32212 LT52WTV which is currently on loan to Norwich, seen here in Castle Meadow. Stagecoach Norfolk run the X29 service between Fakenham and the City and various vehicles can be noted on the route, today saw Coasthopper liveried 37439 SN16ORJ employed on the service. Borderbus of Beccles have recently aquired 3 ex Stagecoach London Scanias and 209 LX59CNE is the first to have been refurbished and seen in use in Borderbus livery, today on the 146 service to Southwold. The demise of Anglianbus has been well reported as we all know, vehicles are now gaining Konectbus fleetnames after the fleet was rebranded, Optare Versa 307 AU11ESG seen here in St Stephens on the 37A to Mulbarton. Finally on my way home i noted First Southampton loanee 32809 T809LLC changing drivers at Caister Road whilst working the 1 service to Lowestoft. Short wheelbase SN10CCZ arrived at Konectbus about a month ago, on loan from Hedingham, and has been given fleetnumber 297 although 508 is displayed on the bus and Simon's bus ticket also showed the same number! My thanks to Simon for the information and photos. 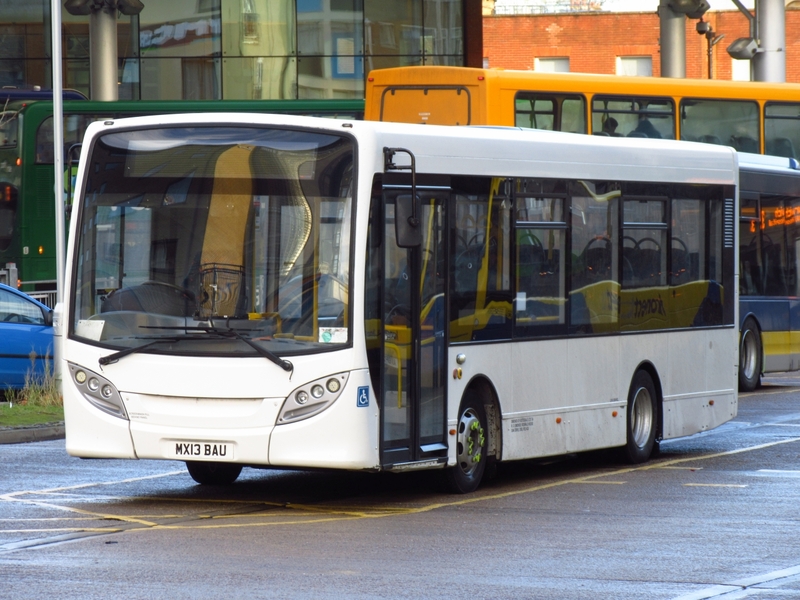 There are no changes to local bus services to relate following the publication of today's Notices & Proceedings Report by Eastern of England Transport Commissioner. A Couple of Coaches noted at Potter Heigham yesterday whilst driving through. Both were on duty at Lathams Superstore in the broads village, no doubt full of Christmas Shoppers. First up is VDL bodied WJ17EYS which is operated by Premier Transport of Crawley in West Sussex. The other visitor was National Holidays Setra NH13BWH which is here on a tour to Yarmouth and taking in the Thursford Christmas Spectacular also. 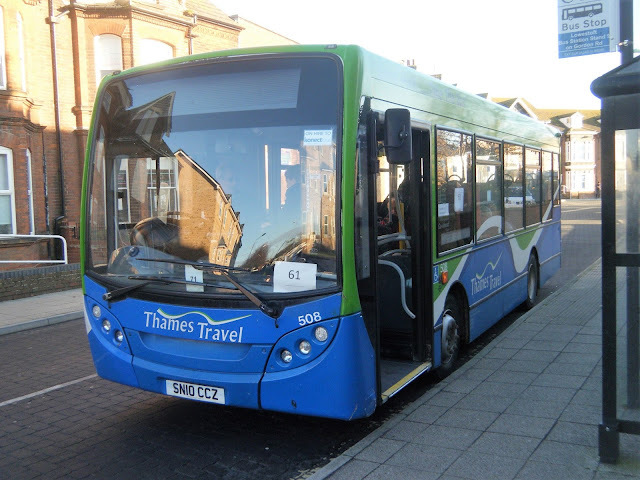 The testing of real time bus information has started in the Great Yarmouth area. My first experience of its use was the recent appearance of an information pillar at the south end of the town's Market Gates Bus Station close to its junction with Regent Road. The display of real time information was first noted on Tuesday of last week. First Eastern Counties workings were shown along with the BorderBus 580 journeys. Information on the other sides included a diagrammatic bus map of the area, local attractions with connecting bus services plus a rail timetable. Whilst this is much needed, particularly during the summer months, I noted at the time that it was already out of date with Anglianbus (Konectbus) 61 no longer operating from Market Gates. However, the information has subsequently been corrected on all three panels - well done to those responsible! Bus stops at the terminus already use the information plus there are also screens appearing at selected sites throughout the area which I have yet to see in use. Today's Notices and Proceedings Report, published by the East of England Transport Commissioner, contains a few changes to local bus services. Anglianbus has cancelled its 7A service between Blofield and Great Yarmouth College to take effect from 5th January 2018. Incidentally Konectbus has registered a successor 85 service between Surlingham and Norwich from 2nd January 2018 - replacing that operated by Anglianbus. R Hamza Hatukai of Godetia Court in Lowestoft has submitted an application for a new operating centre for one vehicle at Lowestoft Marina, South Elmham Terrace in the town. Just before lunchtime today I drove along the seafront at Great Yarmouth and was surprised to see a National Holidays' Mercedes Benz Tourismo parked up. NH16JEH is on a three day trip taking in the Thursford Christmas Spectacular. As I was about to return to the car, a predominantly white Irizar bodied Scania K340EB4 was seen heading towards me in the form of Richards Coaches GDZ405. Already armed with the camera I got this shot. Surprising what you can sometimes see when driving along Marine Parade!! Whilst they were busy spending money, yours truly retired to St Andrews Street and the bus station area for my fix of bus photography. On arrival, the bus station was dominated by the presence of Mulleys decker MUI7949 which was noticeable for its application of fleetnames. Arriving soon after was Galloway's Optare Solo 279 (4092PP) which was formerly registered MX53FDN. It's next working was the 386 to Stowmarket. 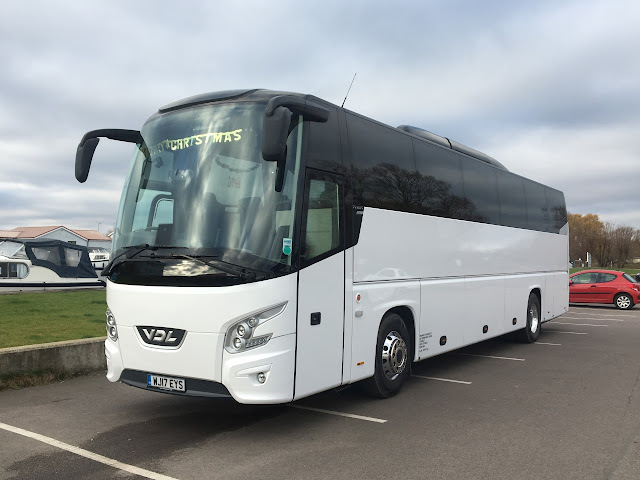 Another decker making an appearance was Coach Services' Volvo B7TL LF52UOV which the operator acquired in March last year from dealer Ensign. 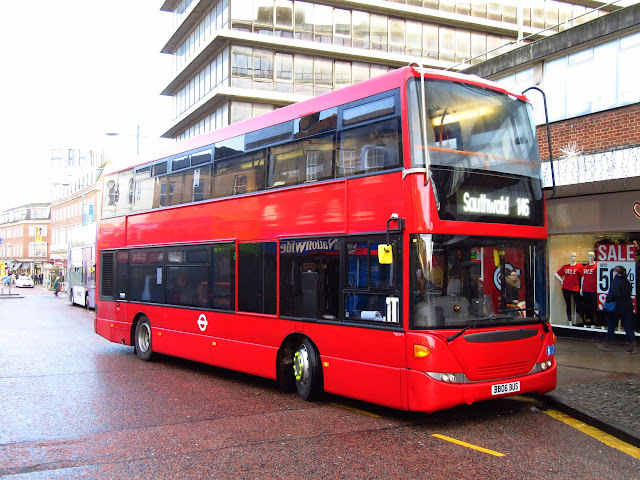 It was originally Arriva London's VLW122. Other vehicles appearing from the fleet during my period of observation were ADL Enviro200 SN63NBB, Volvo B7RLE BJ60BYX and Volvo B8RLE BU16OZO. Stagecoach East were noted employing 'Greener Smarter' liveried Wrightbus Eclipse Urban bodied Volvo B7RLE 21226 (AE09GYW) on an early afternoon 11 service from Cambridge. Similar liveried Alexander Dennis Enviro400 bodied Scania N230UD 15465 (AE09GYP) followed on a later 11 working. 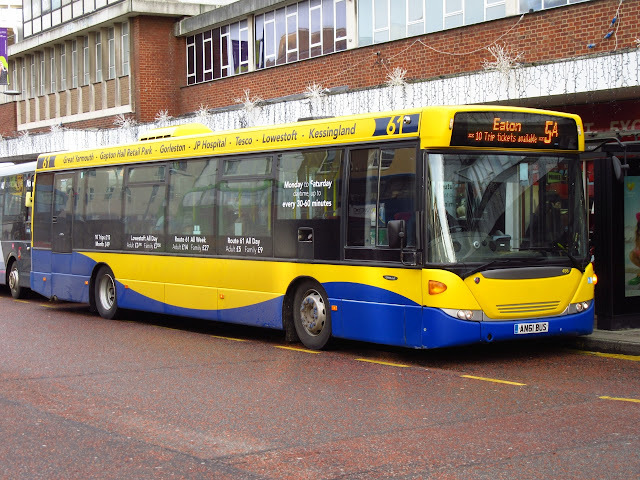 A surprise appearance was a Hedingham branded Alexander Dennis Dart 260 (EU56FLR) operating with Chambers legals. Another Chambers decker in use was Scania N94UD 1501 (YN55PZD) - similar to a trio recently operated by Anglianbus. My final photo is of Mulleys YN04UJT - one of a number of Scania N94UDs recently acquired from Nottingham City Transport.